The Cookbook Indesign template is a fully designed ready to print cookbook. 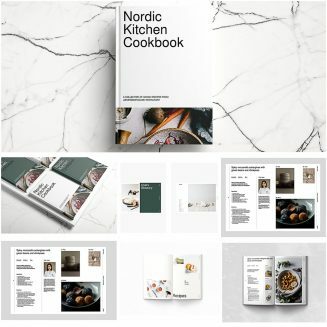 The cookbook features sections for stories, photos, and recipe. It is designed to industry print standards and is fully customizable. It’s perfectly suited to kitchens, restaurants, entrepreneurs, chefs and designers looking to showcase their culinary work. File format: .indd, .idml, .jpg Photoshop or other software. Tags: book, book template, brochure, cereal, cookbook, hygge, indesign, indesign template, kinfolk, lifestyle, minimalism, nordic, portfolio, recipe, white.